'Scandalous Decision': How A Turkish Banker's Conviction In U.S. Is Roiling Ankara : The Two-Way A federal court in New York City convicted Mehmet Hakan Atilla of participating in a plot to evade U.S. sanctions on Iran — but Turkish leaders are decrying the decision as "unjust and unfortunate." 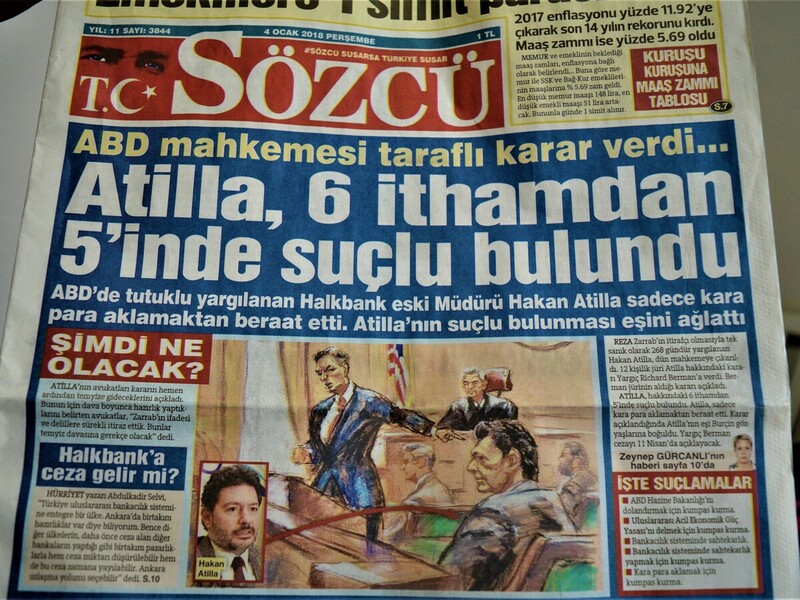 Sozcu, a Turkish daily newspaper seen in Ankara, runs Mehmet Hakan Atilla's conviction as front-page news on Thursday. The conclusion of the trial against Mehmet Hakan Atilla, the deputy director general of Halkbank, has done nothing to ease the frictions it has inflamed between the U.S. and Turkey, however. Ankara, which has long protested the case, announced Thursday that the decision marked "an unjust and unfortunate development." "Based on the so-called 'evidence', which are forged and susceptible to political manipulation, and dwelling on Turkey's internal affairs on a fictitious basis, the U.S. court has been drawn into Turkey's domestic affairs in an unprecedented way," the Turkish foreign ministry said in a statement. Atilla had been just one of nine defendants charged with participating in a plot to channel billions of dollars into Iran, opening an effective exchange of oil for gold despite U.S. sanctions against the country. Still, Atilla has been the only man tried on those charges to date: another defendant, gold trader Reza Zarrab, pleaded guilty and turned star witness for the prosecution, while the other seven co-defendants remain at large. Zarrab's testimony detailed a massive money-laundering program that unfolded for years and reached the highest levels of power in Turkey, even President Recep Tayyip Erdogan — who, according to the BBC, allegedly "instructed Turkish banks to participate in the multi-million dollar scheme" in 2012 when he was prime minister. Prosecutors did not include Erdogan in their indictment, nor did they mention his name in their statement immediately after Wednesday's verdict. Rather, they concentrated criticism on Atilla, celebrating his conviction as a crucial act of justice. Atilla "used his high rank at a Turkish bank to disguise the transactions as humanitarian food payments and deceive American officials, but now, after receiving due process of law, he has been held accountable in court, by an impartial jury," Acting Assistant Attorney General Dana Boente said. "This successful prosecution is another example of our resolve to pursue and bring to justice those who violate our sanctions and other laws that protect our national security." The verdict came as unwelcome news to Turkish officials in Ankara, where the trial has roiled political conversation for weeks. "The president of Turkey, the foreign minister, the prime minister — they're all talking about it, and they're blaming the court. They're blaming the judge. They've long blamed the prosecutor's office here," Ben Weiser of The New York Times told NPR's Robert Siegel last month. On Thursday, Erdogan's office came out hard against the decision. "This [verdict] is a scandalous decision of a scandalous case," presidential spokesman Ibrahim Kalin said at a news conference, according to Turkey's state-run Anadolu Agency. Moreover, it is loud and clear that this case is a conspiracy aimed at complicating Turkey's internal politics and intervening in Turkey's internal affairs." Deputy Prime Minister Bekir Bozdag echoed this complaint in a tweet Thursday, decrying what he sees as an act meddling with Turkey's sovereignty and calling it "contrary to international law, too." And it appears that the backlash is not confined to politicians' statements. The Daily Sabah, a pro-Erdogan Turkish newspaper, reported Thursday that an Istanbul court has issued an arrest warrant for one of the key witnesses for the U.S. prosecution, a former Turkish police officer. The paper also notes the court has prepared an "extradition request to be sent to the U.S. for the suspect." Atilla's employer, Halkbank, issued a statement pointing out that it is not involved in the case and asserting that its practices have complied with international regulations. Atilla himself is scheduled to be sentenced on April 11, and he faces the possibility of up to 30 years in prison for his bank fraud conviction alone.